Nothing but positive, in fact wow crazy positive. In the right side highlight we see green is above is below yellow, by a big margin. Not great. Watch this carefully, all recessions have falling industrial production, new data is from the end of June, looking a tiny bit better. A new up white brick, nothing but strength. Now nearly 87% stocks are above their 50day MA. Strength despite sell off. Bonds lag consumer flat, bullish with caution. Defensive staple stocks like dividends, utilities are starting to bounce back as risk is coming off. Consumer is taking a kicking. The Dow Theory says that transports often predict a strong economy. The idea is if rail cars are full of raw materials and finished product and Fed Ex is delivering tons of stuff for Amazon the financial reports of companies will reflect a rise soon. Here is a chart of the Dow Transport index. Looks positive. Equities are boosted by TINA (There Is No Alternative) (a term coined by Margret Thatcher) because money must flow someplace and not much else looks good. The Price to Earnings ratio shows when the price of a stock is too high compared to earnings. The current P/E is 25, which places the Index well above the normal overvalue level of 20. Last quarter the P/E was 24, so the situation is getting worse. To clarify, the S&P 500 is at 2162, which is 25% above the overvalue level of 1729. The current P/E is 50% greater than the normal 10 to 20 point P/E range. In short overbought, but nothing like the Tech bubble of 1999 that hit a record PE ratio of 45! Well frankly, everything positive, from banks to industrials, except oddly the consumer. Safety is taking a back seat as gold retreats a bit and utilities lag, but a big uptick in both Friday. The party continues internationally, especially commodity based economies. 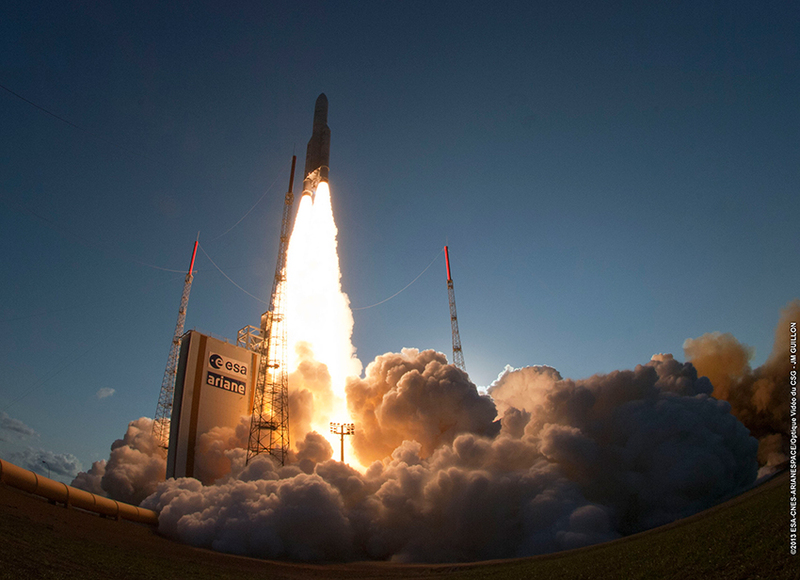 With the big push in the markets recently, global markets continue to break out to 52-week highs. Brazil hosts the world in three weeks with the Olympics. Even some former basket case like Brazil and Russia are at 52 week highs. Canada and Australia are doing better too. Well as I said, we have broken out in to new territory and all the "buy the breakout" traders and computers piled on. A few will want to take profits here, and we saw that in selling on Friday. 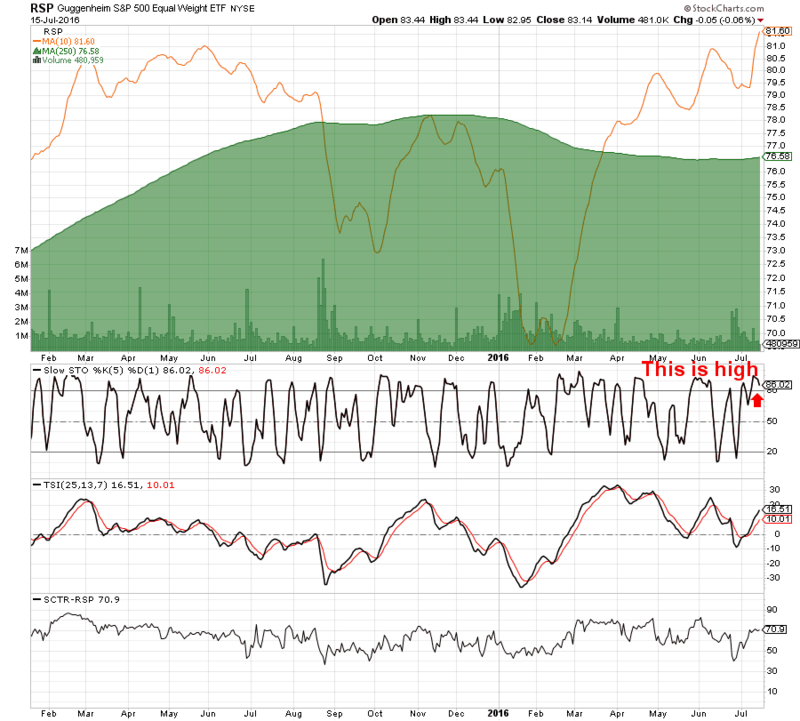 Here is a chart called "Above the Green Line". It is my version of the charts provided by Joanne Klein click here to read her free excellent blog. If you are looking for a simple trading system that works, she is as good or better than most. 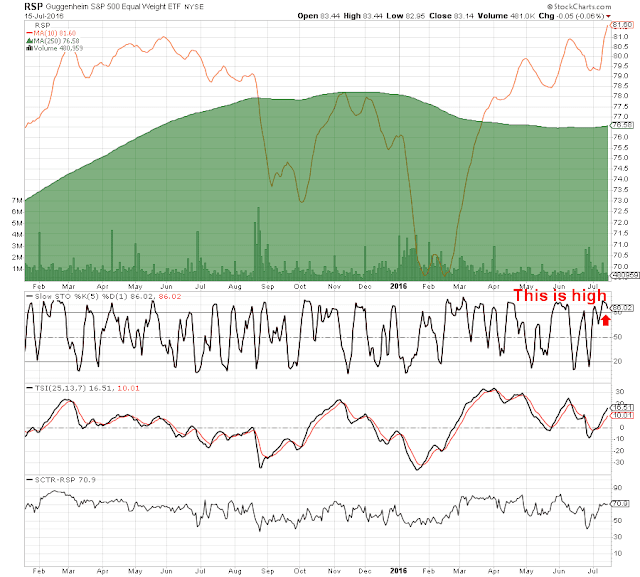 The first indicator with the red arrow is the Slow stochastic (Joanne calls this the money wave) and right now it is indicating Overbought. However, markets can stay overbought a long time and even if they do pull back a little they are likely to resume their upward climb. So just because we are overbought, does not mean anything like a big correction is on the horizon. 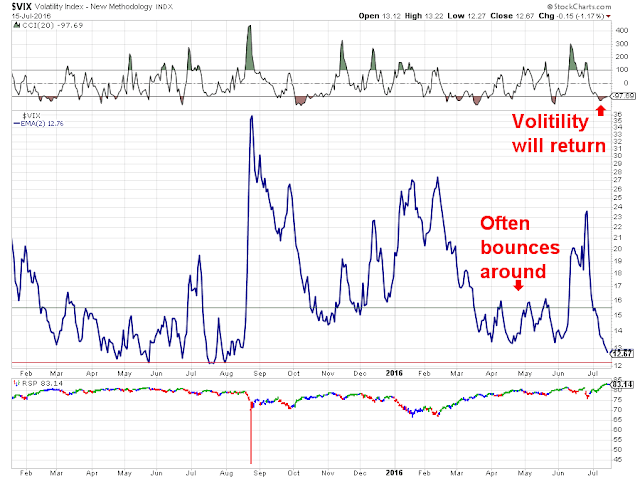 The VIX is the fear gauge as investors buy high and sell low due to emotions of fear and greed. Well its all on for greed right now. 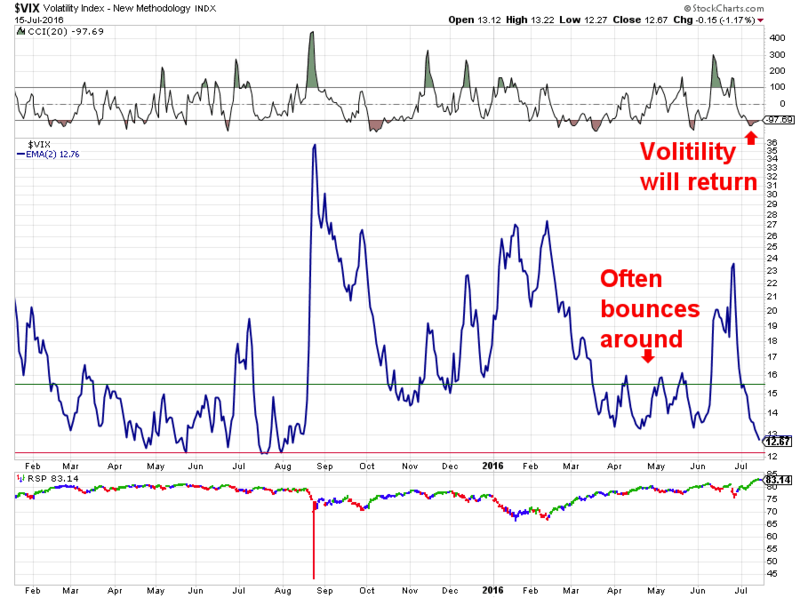 We can also see the over enthusiasm in my 207 VIX chart, shown here with an indication that caution has now been thrown to the wind and probably will return a bit soon, again probably a minor pull back for a few days of profit taking. We saw this on Friday. So what do I think? I think we are heading for short term weakness in a serious bull market. This would appear to be a very broad, worldwide push. My take would be that we are probably not in a bear market when we are breaking out to new 52-week highs. Keep an eye on the OBV chart in the next weeks, the pros will probably grab some profits, but for most long term investors sit tight, this could be a very bullish summer.